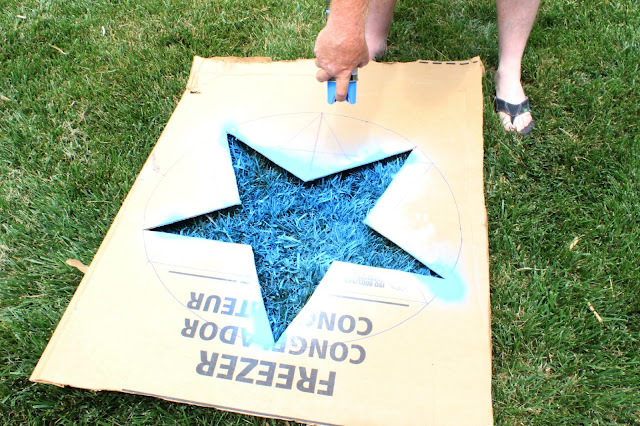 I told you yesterday that I'd show you how I made my lawn stars. The entire thing took about 30 minutes from beginning to end. Update: This is now my most viewed post and it's garnered many questions. I'd like to go ahead and answer the three most asked questions here. First... This paint is specifically made for using on grass and it will NOT kill the grass. I can personally attest to that fact. Second... The paint is construction marking paint, it's intended to be sprayed upside down, and can be found at any home improvement store. Third... It dries very quickly and is permanent. It only comes off as the grass grows out and you mow it off. I thought I might also address the fact that I've been a teensy bit absent from my blog for oh, the past month and a half. The last time we talked, I told you I was starting a second job back at the hospital. Well life happened as life so often does, and things got a bit crazy here in the month of June. As of this week, I'm no longer working in the office and am full-time back at the hospital. I'm really excited about this change, and since I'll be working 12 hour shifts at night, I hope to have tons more time at home to spend with my family! There might also be a tad more time to work on some crafty/decor things... I'm crossing my fingers! Basically, I just wanna say I'm thrilled to be back with you at my little blog, and hope you'll join me for some fun in the future!! Did the paint not kill the grass? 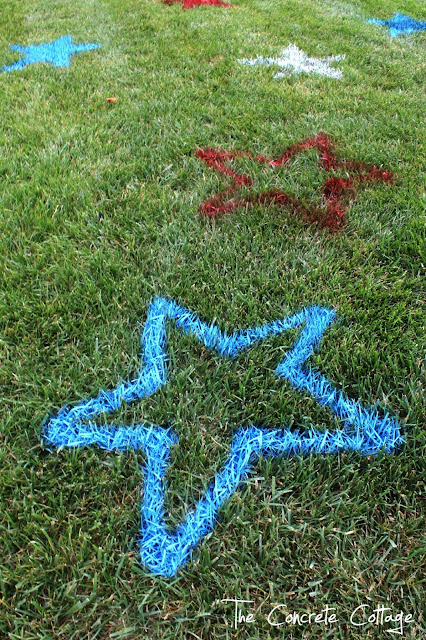 It's construction marking paint which is water based and intended for grass. My husband (who uses it for a living) assures me the grass will be fine! The football field sounds like so much fun!! I'll bet they had a blast! What a fantastic idea!!! I'll need to do this next year! Thanks for sharing! Love this idea. I just hope our HOA wouldn't gripe about it...they are kind of strict. Good luck with the new change of schedule, especially if it nets you more time with the family. As soon as the paint dries (which is pretty quickly as its outside with the heat and wind) it won't come off on a thing! Doesn't track on anything! What an fantastic idea! I would love to showcase one of your pictures on my blog post for some DYI ideas for the Fourth of July with your permission :) Thanks for the creative and easy craftivity! 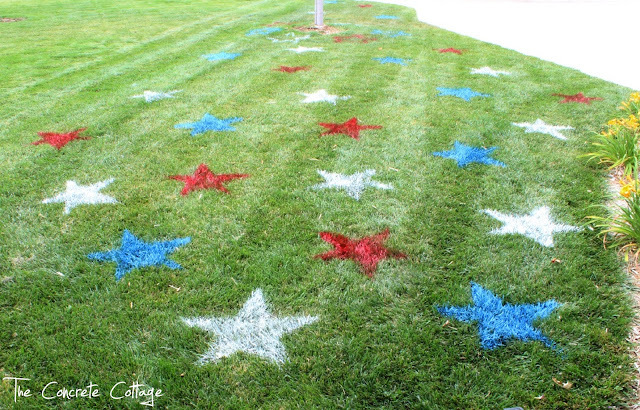 How long does it take for the paint to wear off of the lawn? And where do they sell construction paint? 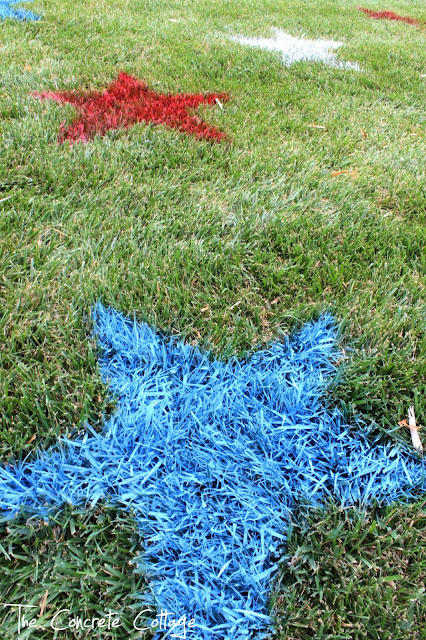 Hi Katie, the paint actually doesn't wear off, it grows out with the grass and gets mowed off. So the answer is however fast your grass grows. For us, it was gone within a week or two. You can find the construction paint at Lowes, Home Depot, WalMart, or any building store. Where can I find the paint? Any home improvement store should carry it in the paint area. I've seen it at my WalMart before, but have been told by others that theirs doesn't carry it. Can't you just use regular spray paint? Love the idea!! How long does it take for the paint come out? Please refer to the "Update:" that you can find towards the end of this post. It answers your question. Oh, I've been wanting one of these! 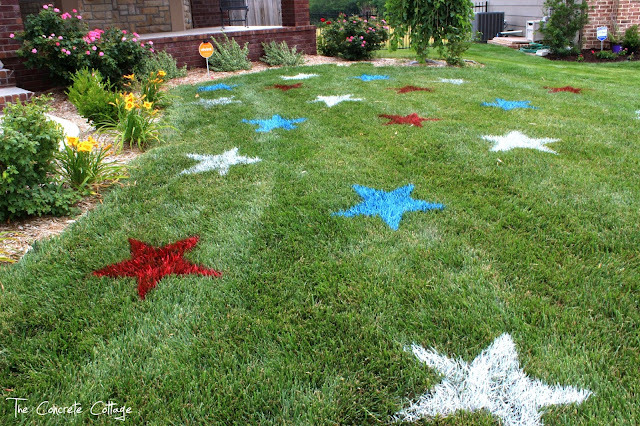 Happy 4th of July... with painted lawn stars!